“No Safeguards” Selected as a Finalist for Quebec Writers’ Federation Fiction Prize! The Quebec Writers’ Federation recently announced the finalists for the Paragraphe Hugh MacLennan Prize for Fiction, and H. Nigel Thomas’ No Safeguards was selected! Thomas’ book was selected along with Daydreams of Angels by Heather O’Neill and Boo by Neil Smith. The Quebec Writers’ Federation provides community support for the promotion and encouragement of English language literary arts within the province, recognizes the achievements of Quebec’s English language writers through annual literary awards, organizes activities for promoting public awareness of Quebec’s literary arts and institutions, and applies for grants to further these purposes. 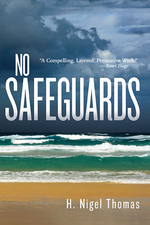 No Safeguards is the first in a trilogy of novels focusing on Jay and his brother Paul from childhood to young adulthood. The book deals with the impact of fundamentalist Christianity on their family, the ways that this becomes even more poignant when they leave their grandmother’s home in St. Vincent to join their mother in Montreal, and the further oppression that the brothers encounter when it is revealed that they are gay. Posted in Awards, Contests, Fiction, News. Tagged with H. Nigel Thomas, No Safeguards, Paragraphe Hugh MacLennan Prize for Fiction, Quebec Writers' Federation. Comments Off on “No Safeguards” Selected as a Finalist for Quebec Writers’ Federation Fiction Prize!